Five years ago today, I became a mom. Five years ago today, our firstborn and Bennett's brother, Oliver, came into the world. So, today, we celebrated. "Say 'Five!'" Oliver is crazy about tornadoes...and has been for almost two years now. We own about every tornado toy or tornado book that exists. And Oliver is adamant that he wants to be a stormchaser and move to Oklahoma when he grows up (he believes tornadoes are constantly roaming the state of Oklahoma). 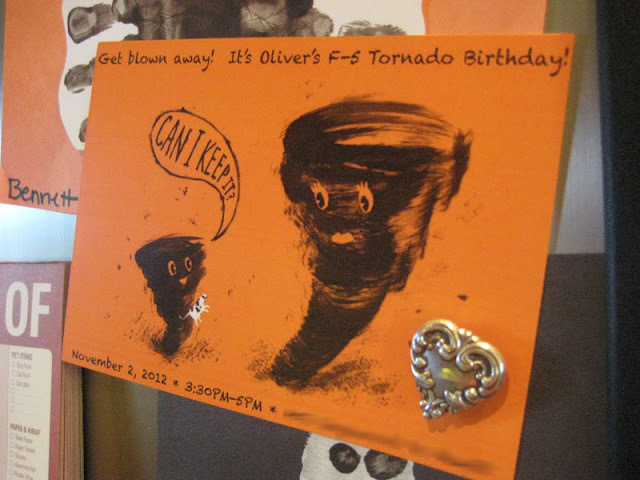 So, it just makes sense that Oliver would choose a tornado theme for his fifth birthday. The table. We hung white pom-poms from the chandelier with little blue rain drops hanging from them. On the window, we hung different blue-shaded rain drops coming down like rain, with tiny lightening rods sprinkled throughout. The cake, tornado and destruction, a gift from a friend. Isn't this just the cutest tornado cake!? It was made by our friend Joy, who has made many of the boys birthday cakes over the last few years (see here and here). I love how Joy took the side of the house off and covered it with dirt and debris. Super creative. I wish I had a picture of Oliver with the tornado. I do but it's backlit and washed out. But he LOVED his birthday cake. It was so exciting to him. When it was cake-time, he was insistent that he wanted to eat the tornado, not the house. Oliver's favorite part was his name rotated on top of the tornado. We gave the kids "rain water" (blue kool-aid) to drink. What better than to drink out of tornado glasses (plastic martini glasses)? The great thing is Bugels they make awesome "baby tornadoes". Chocolate "baby tornadoes" are delicious!! And don't look for Bugels at your local supermarket. I could find them only at the gas station, interesting, eh? No tornado party could be complete without a large tornado decoration. So, I figured out a way to make a tornado hang from our fan using black paper and black streamers. The coolest thing was it turned out that it actually rotated when we turned the fan on. Oliver LOVED it! He kept telling me, "mom, you did a really good job," which made my heart melt. The best thing is so did the other kids. All of the children sat in awe as we turned the fan from low, to medium to high and pretended it was moving from an F-1 to an F-5 tornado. Here is a video of the tornado after the party was over and before we tore it down. A family picture with our new 5-year-old. Aunt Brooklyn stayed in town to join us for Oliver's birthday. She was SO helpful during the party and with decorating. We love our Aunt Brook and could not have had a successful birthday without her! Aunt Brooklyn gave Oliver a special tornado shirt for his birthday. He was so very proud. Let's be honest, tornado shirts are hard to come by. But, thankfully, this website had a cute one here. Oliver had a fabulous time with his friends at the party. Oliver received several science kits, a weather station and a solar system model thing that lights up and rotates its planets. It was fun to see Oliver's little inquisitive personality come out, even in the gifts he received at this five year birthday party. Along with the tornado tube, our little guests were provided chocolate lollipops in the shape of lightening rods (I couldn't locate anybody who made chocolate lollipops in the shapes of tornadoes). The tags we placed on the chocolate lollipop party favors stated, "Thanks for weathering this storm with me!" Unbelievable. Five. Truly a little boy. And I have no doubt this guy may very well become a storm chaser or meteorologist when he grows up. But, whatever he becomes, I hope he doesn't get there too fast!! These last five years have just flown by. We love you, Ollie-bear! This party is amazing! You should seriously become a party consultant! So much better than my tornado birthday, which involved most of my guests having to go home, and the rest of us huddling in the basement with no power. That's April in Missouri for ya! I love your ceiling fan tornado. Could you tell me how it was constructed? Thank you so much! I think I will be stealing most your ideas! It's not east to find things for a tornado birthday. A local arcade makes funnel cake, so we are thinking funnel cloud cake and ice cream with Oreo's in it, so it looks like dirt. My son loves the show Storm Chasers, which used to be on Discovery Channel. The star of the show, Reed Timmer, has a book my son really wants and they will autograph it for just $5 extra. My husband had the idea of putting presents in cardboard boxes, instead of wrapping them, and labelling them FEMA and disaster relief. Ooh!! I LOVE the Funnel cake idea!! Wish I had been able to use that one! Great one! Yes, we love Storm Chasers too. I have thought about getting an autograph as well so great minds must think alike! :) I hope your son loves it!! And I think your hubby's idea of putting presents in FEMA disaster relief boxes is adorable! So excited to find another momma as passionate in her son's tornado interest as I am. :) Send me any more ideas if you have them!! Hope your party goes well! I happened upon your blog today. Love your ceiling fan tornado! I am going to do a Wizard of Oz theme birthday party for my soon to be 5 year old daughter and I think this would be a great idea! Thanks for posting! Coolest party ever!! The tornado fan was amazing! My son is turning five soon and he too wants to move somewhere in "tornado alley" and be a storm chaser in a DOW truck :) We have watched all the shows on Netflix with tornadoes and checked out every last one (multiple times) from our local library. He has asked for tornado toys for the past two years for Christmas, but I didn't think such thing really existed! This year he wants a tornado birthday so when googling 'tornado cake' I found your blog. Such great ideas!!!! I love the party favors with the lollipop and the cute saying. Thanks for posting this!